So you are paying thousands of dollars to do your Core Banking? Well, don't. 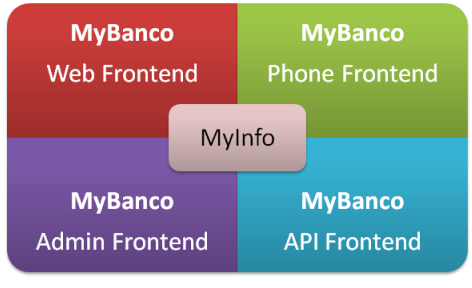 MyBanco let's you do your core banking without paying one cent. Save on your bank's TCO (Total Cost of Ownership) by reducing the money you pay to companies offering proprietory systems, and start saving money, by using free and open source software. Got growing pains? Get rid of them simply. Just by adding servers, you can easily scale the load of your website. Instead of buying more licenses, buy more hardware. Our Remote Procedure Call (RPC) protocol is simple and easy to implement. Start talking to our software in minutes, not hours. Our solution was designed to be able to scale, and to be able to scale well. By removing support for older technologies, we really have been able to speed our system. Not only is our code fully open source - free for anyone to see, it is also well documented, so everyone knows what is going on. XBank, our cross-bank communication platform allows more messages to be transfered between banks then any other system presently on the market. Every transaction is logged. Infact, there is no way that money can be placed into an account without it not being in the logs. Be sure you always know where money is going. Copyright © 2008-2019 Tim Groeneveld. All rights reserved.